By stayhomecupcake on February 11th, 2011 . Filed under: Cupcake Ideas . Red Robin is one of my family’s favorite restaurants because of their kid-friendly atmosphere and their yummy burgers. Now we have three more reasons to love it! They have cupcakes! I haven’t tried them yet so if you have, please click on the comment area below and let us know how they are. I reviewed them on my blog last month! I actually has some just today! The lemonade one wasn’t very good but the chocolate was delicious! They have filling in the middle. I’ve tried these. They were good, but not stellar. I wouldn’t buy them again. I give them a 5 out of 10. I live in DC and cupcakes are super popular in this area. 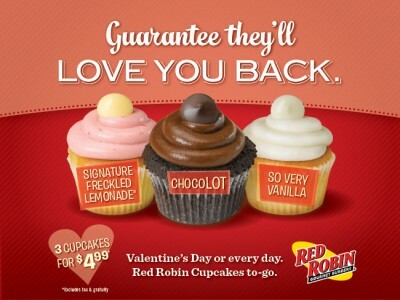 I’ve tried all 3 cupcake flavors at the newly opened Red Robin in Bowie, Maryland. I like the vanilla flavor the best; the frosting on all 3 flavors was delicious, but the vanilla cupcake seemed to have the better balance of flavors and moistness in comparison to the chocolate and pink lemonade cupcakes. I wonder if the cupcake taste/quality differ per Red Robin restaurant. Hmm?? Overall, I rate Red Robin’s cupcakes a 6 out of 10.